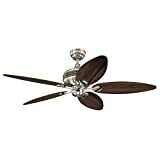 Add a unique and dynamic focal point to any room with the Westinghouse Xavier II Ceiling Fan. The brushed nickel finish with gun metal accents provides a contemporary look, while the graphite and weathered maple reversible blades make it easy to match or change your room's decor. The Xavier II's three spotlights let you direct light where you need it, and its three fan speeds (high/medium/low) and reversible switch help you stay cool in the summer and warm in the winter. The Westinghouse Xavier II ceiling fan is backed by a lifetime motor warranty and a two-year warranty on all other parts. Product reference number 72342.